When I was a kid, one of my favorite things about Summer was playing out in the sun all day long, and waiting for the sound of the Good Humor truck to drive around my neighborhood. The ice cream man always came at the perfect time, between 6:00 and 7:00 p.m., right after dinner, and when I was back outside playing with my friends. Most of the time, we were out on our bicycles, and we’d race around the neighborhood to follow the Good Humor truck. There was no ice cream in the world that tasted better than the ice cream from the Good Humor ice cream man. Waiting for the sound of the Good Humor truck and running to get ice cream from the ice cream man became a Summer tradition for me and I’m sure for many American kids. What Summer day wasn’t complete until you had ice cream from the Good Humor man? Even as an adult, I’d spend my Summer evenings waiting for the jingle of the ice cream truck bells. Some things you just can’t ever outgrow. Last summer was Baby G’s first summer. She was only a few months old, however, and too young to know about the meaning of ice cream. I’d take her around in her stroller in the Summer evenings, and I’d whisper to her to listen for the bells of the ice cream truck. Here in New York, it’s the Mister Softee ice cream truck. I was excited for this Summer because I thought she’d be old enough to listen for Mister Softee. But the Summer has come, and shortly, it will turn into Autumn. 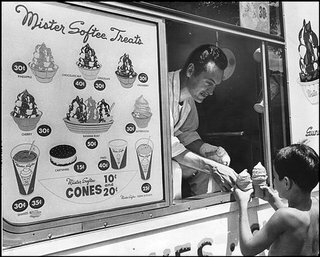 Because of the recession and the outrageous prices of gasoline, our neighborhood ice cream man, Mister Softee, has retired. I ran into him at the park one weekend, and I asked him where he had been. I had already surmised that the high prices of gasoline had driven him out of business, but I was still crestfallen when he confirmed my thoughts. “I just cannot afford it no more!” he explained. He had been the neighborhood ice cream man for almost forty years. I am old enough to have experienced the days when milk and eggs used to be delivered to your doorstep, although it was already coming to the end of its days when I was a kid. I still hear some elderly people reminisce about those days, and I wonder now, if I will be one of those people that can’t ever get over the end of the Good Humor and Mister Softee days. Posted on July 21, 2008 April 6, 2019 by ♥ N o v aTagged childhood, G, life, thoughts. Next Next post: Take My Puppy! 😦I\’m missing the ice cream. i miss a lot of things from my childhood… like street games and climbing trees and just being outside. and street food such as dirty ice cream, cotton candy and taho… haha! my younger siblings didn\’t get to experience that. instead they have computer games, wc is sad really. The ice-cream man was one of the highlights for me too as a kid. It makes me sad that these things end. I never thought I\’d be one of those people saying \’I remember when\’ but i guess I am. You know, I don\’t see ice cream trucks anymore. I hardly see guys pushing around ice cream carts either. You know what I miss is that I don\’t see Good Humor strawberry shortcake ice cream bars in the markets. Those take me back. We used to have the icecream man come around our neighborhood every summer. But we noticed he stopped coming about 4 years ago. I don\’t think it was high gas prices that made them stop coming. I think it was plain old suburban parental stranger danger fear.Very sad. My kids lived for the ice cream person to come by – even if we had it in our freezer, it tasted better from the ice cream person. That\’s sad about the ice cream man. The ice cream man didn\’t come to my house but my maternal grandma\’s cuz she lived in the HUD housing. But I gotta admit that you can\’t forget that sound. I can relate to this so much. This is the essential sound of summer for anyone over thirty. The fact that he came to you, and played a song — almost like a bell calling people to church — was truly exciting. Now you\’ve made me think of Push-ups, Bomb Pops and Alexander the Grape. My daughter knows all about the ice cream truck! Fortunately, we still have one that comes around. I loved the ice cream truck when I was a child, and I\’m glad she does, too. I have had about 273 jobs so far and one of them was making ice cream for Deroschers Premium in Nashua NH which was ultimately purchased by Hershey Ice Cream. I ran a 75 foot long machine called a Vitaline that made all the stick-based products such as popsicles and creamsicles. Not only were we allowed to eat as much ice cream and other frozen treats as we wished, we had to take perodic samples for quality purposes. Surprisingly, I never go tired of ice cream and to this day it is one of my favorite foods.